Cell publishes findings of unusual significance in any area of experimental biology, including but not limited to cell biology, molecular biology, neuroscience, immunology, virology and microbiology, cancer, human genetics, systems biology, signaling, and disease mechanisms and therapeutics. 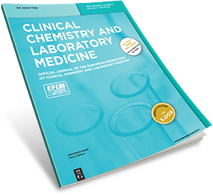 Clinical Biochemistry publishes articles relating to clinical chemistry, molecular biology and genetics, therapeutic drug monitoring and toxicology, laboratory immunology and laboratory medicine in general, with the focus on analytical and clinical investigation of laboratory tests in humans used for diagnosis, prognosis, treatment and therapy, and monitoring of disease. It is the primary objective of this publication to encourage the bridging of the gap between clinicians of all relevant specialities and biomedical scientists working in areas from biochemistry and molecular and cell biology to physiology, pharmacology and pathology. NEJM.org keeps you connected to the medical research and clinical insigths you need to improve patient care. Thrombosis Research is an international journal with a goal of rapid dissemination of new information on thrombosis, hemostasis, and vascular biology to advance science and clinical care. The journal publishes peer-reviewed original research, along with reviews, editorials, and opinions and critics. Trends in Molecular Medicine publishes commissioned, peer-reviewed articles that aim to understand and explain the molecular basis of disease with a view to clinical practices. Original research articles published in Nature Medicine range from basic findings that have clear implications for disease pathogenesis and therapy to the earliest phases of human investigation. The Lancet is a weekly peer-reviewed general medical journal. It is one of the world’s oldest and best known general medical journals.